So the Tetris Color Charm Swap is just about finished up which means we are ready to get going on the Quilt-A-Long. The Tetris Quilt-A-Long will officially start on July 17th, and will have weekly posts each Tuesday until August 28th, with a Parade and Grand Prizes on September 11th. So . . . How about a rundown on how it's going to work!! When I came up with this idea I wanted it to be pieced as if you are playing the game. Therefor, their isn't a set pattern. For 6 weeks, on each Tuesday ( July 17th - Aug 21 ) you will be given the tools needed to build a block. Everyone's blocks will be different as everyone has their own strategy on how to play. I think the easiest way to explain will be to just show an example. Do Not build this block. It is only an example!!! Starting with the first rectangle, color the first "piece" into your grid. Now if you have never played Tetris before here is a bit of a crash course on placing your pieces. 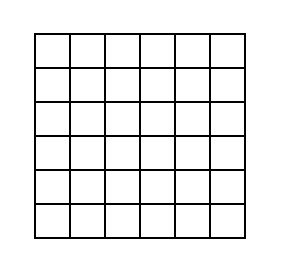 Your piece will continue to move down the grid until it hits another piece or the bottom of the grid. (So don't color your first block in the center of the grid, that's impossible). If the rectangle has more than one piece in it that doesn't mean you use all of those pieces. Those are just the variations on how that piece can be used. Choose the variation that works the best for you. And Tetris was a timed game. So don't think about it to much. Just place your piece and move on to the next one. (Having little holes here and there looks cool. When you get to the top of your grid and can't fit any more pieces you are done. I really want to keep this fun and I want you to be super happy with your results, so with that in mind . . . Please don't feel like you have to make yours exactly like mine. Make it so you will be happy with it. If you don't like a color I am using . . . Don't use it. Just pick another color when that one pops up. If you don't like the size square I am using . . . Use a different size. To figure out the total size of your quilt just take your size square minus .5 and then times that number by 12 for the width and by 18 for the length. If you don't like print charms . . . Use solids instead. If you don't like the idea of just squares . . . Make it fancy. I think a HST version could look really cool!! All those that finish their quilt top will be eligible for the Grand Prize. The Grand Prize's are sponsored by The Intrepid Thread and huge Thank You goes out to Julie for her generosity in these prizes. Wan't to know what they are??? 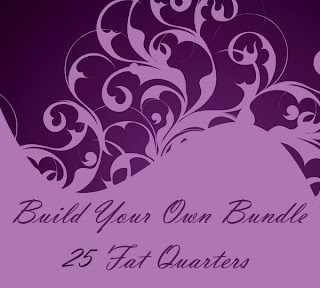 And a Complete Fat Quarter Bundle of La Dee Da by Erin McMorris!!! There will be 3 lucky Grand Prize winners. Their first will be allowed to choose their prize, and so on. We thought it would be fun to really mix up the grand prize allowing you your choice to which way you prefer to get fabric :) And if that whopping amount of fabric goodness isn't motivation, then I don't know what is!! But . . . Sometimes it is hard to keep motivated when the end is so far away. So for that . . . We have a little Weekly Motivation. Each week you will be able to link up (You don't have to have a blog to link up, you can link to a flickr picture :) your completed block for a chance to win the weekly prize. These will come in the form of Layer Cakes and Jelly Rolls!!! (I love pre-cuts!!!) These Weekly Prizes are sponsored by Fat Quarter Shop and a huge thank-you goes out to Kimberly and her team for their support in this Quilt-A-Long!!! And just to keep you on your toes . . . And keep things lively . . . We will also be having random giveaways through the term of the Quilt-A-Long. They might be in flickr, they might be in the posts, they might just be on the blog throught the week :) But they will be great and super fun!! The random giveaways are sponsored by Burgundy Buttons and Green Fairy Quilts. Once again, thank you to these sponsors for their support!! So there is lots of wonderful fabric to be won!!! So keep up and sew on!!! Second, I would love it if you joined the Happy Quilting Quilt-A-Long Flickr group. You can post your fabric here, your progress, and . . . there just might be some giveaways here :) I'm just saying!! And last, but certainly not least . . . How about one of those Random Giveaways!!!! 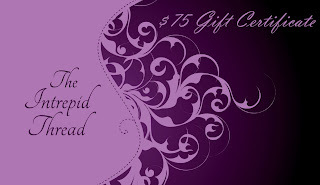 Thanks to Judi of Green Fairy Quilts for sponsoring this random giveaway!! So . 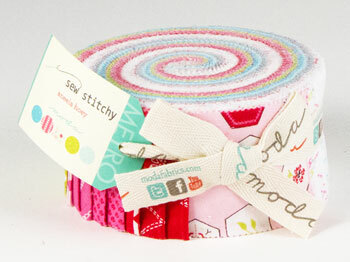 . . How would you like to win a just released Jelly Roll of Sew Stitchy by Aneela Hoey!!! Oh how fun! I wish I could participate, but we're headed on vacation! Can't wait to see your creations! Melissa -- this looks like it will be a fun quilt-a-long and the sponsors -- thank you! I'll be playing along with tiny pieces. I've got a stack of 2 1/2" squares I'm going to cut into quarters to make tiny 4 1/2" blocks. think this would be a great way to use up some of my scraps. I love the idea to create a random pattern! This sounds like so much fun. I did a swap for a rainbow charm pack last year and so to use it I am going to use 2.5" squares. Ready to play! I think this looks like fun. I just might play along. Thank you for such a fun quilt along. I joined the fabric swap and am going to do the quilt along and I can't wait to get my charms in the mail. This will be my third quilt along and I think they are so much fun. I have never played tetris before but I went on line and found a game where I could play a sample one so I now understand it. It is fun! I haven't done a quilt-along before, but each of your posts about this one is slowly convincing me that I want to do this. I think it will be really fun, and could be a good way to get a baby quilt done that I need to get working on! If I can pull it together, I might just join! It sounds like a really interesting quilt along. I've got too much going on at the moment to participate, but I'll be an interested observer. i kinda forgot about this quilt a long. i might not be able to join right now, depending on what i have in my stash. but i think it's a great idea. my brother would love it. This is going to look awesome! Not sure yet if I will take part - see how it goes. Might just make a block or two for cushions. I have had the button up on my side bar, in the flicker pool - waiting for some Tetris fun. I am going to try and participate by symmetry is my thing and I find it hard not to do! I still have not decided if I'm going to do the QAL! It's such a cute idea, I'm leaning towards joining, but I've got a lot going on right now. I need to decide quick. FUN FUN! I'M GOING TO TRY AND PARTICIPATE TOO! Looks like a fun Quilt-A-Long but I will just watch everyones progress this time..
Hey Melissa! I am going to do the Quilt Along! 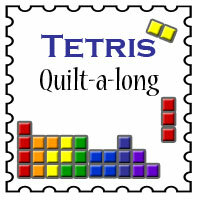 I played tetris as a kid ont he original Gameboy - now I am too busy, to play the video games, but love the quilting concept! I can do one block a week :o) Off to get the fabric for it this weekend! Thanks for putting it together!! I definitely plan on doing this! But oh man... my husband lives 2 hours away (for work) and since it's the summer, the kids and I alternate a week at his place, a week here (we live with my parents). Will I be crazy enough to travel with my sewing machine?! I really want to do a quilt along this year so I am thinking I will participate. and I love the Angela Hooey fabrics/colors. Thank you for the generous giveaway.Beautiful! I'm a very interested observer. I love tetris - but am fearful of starting a (another) new project this summer. I will watch and cheer - and maybe play a few rounds of tetris myself! Thanks for the give-away! I can't wait!! I am sorry that I held things up. Now we are on our way!! You have done a wonderful job of getting prizes gathered up. I like the idea of a chance to win fabric for using fabric! I did not participate in the swap, but I certainly plan to play along with the "game."! I LOVE tetris! A favorite game as a kid! I have a techo-version of the song on my ipod for my running. The prize lineup looks amazing! What excellent sponsors! I enjoy each of the places sponsoring. This looks like so much fun...I wish I could participate but summer is so busy. My daughter and I co-direct two weeks of camp and there is still much to be done. I will be watching, though, and cheering others on. I'm getting so excited about this QAL! And your enthusiastic posts just make it even worse ;) I've already added button to the blog and joined Flickr group, and I'm currently working on cutting fabrics. Yay! I am on the sidelines but loving it and learning so much! This is so fun! I love Tetris, but I'm not sure I can take part right now. I'll definitely be following along! Oh goodness, you had me at Tetris.. and then I tried my best to ignore this. Then, I thought what a nice breezy project and way to use my rainbow charm squares. Then I tried my best to ignore this... and now the prizes. Wowie... and it seems like it's going to be fun with all the encouragement and sharing. So, dangit. I'm in. I love Tetris and this is a perfect idea for a quilt!! I am not sure if I will be able to participate right now because I am a bit overcommitted (big surprise), but I bet I make one in the future!! Thanks for the great giveaway! I can't wait to get my charms back and start next Tuesday. These prizes are great motivation to keep up! I'm thinking about playing. My girlfriend loves video games and it would make a great quilt for her! I'm thinking of doing it as a wall hanging. Super giveaway! You always score the best loot! Wow. Looks like fun! I was not planning to participate, but I am working on a Tesris Quilt for someone alreadt. DO I have to follow the QAL or can I just add my quiolt to the bunch when it is done (I have a slightly more complicated block design)? I was in the Tetris fabric swap and am looking forward to the quilt! I'm really excited about the Tetris Quilt Along. I already have the button on my blog and joined the Flicker group as NY GirlScout. I plan on using 2.5 inch squares and making double the amount of blocks. Thanks for coming up with such a fun and unique concept. Love Tetris! I plan to participate! Thanks for the chance to win! I love this idea! I'm going to try and participate. We'll see if I can get it together and keep up! Love tetris! I have never entered a quilt-a-long but this one sounds like fun. I'm not sure if I have time for this QA, but I'm going to give it a try. I have a ton of fabrics that I got at a garage sale last week. Mine will be scrappy. My squares will be 4.5" due to that's my favorite size on my GO! Baby. I have to save time somehow. Can't wait until Tuesday!!! I can't wait!!!! It will be so much fun seeing how everyone "plays". I have started gathering large scraps and FQ's, Time to get serious and start cutting!! I am afraid I will need to do two of these...my son wants one and so do I! This is my first quilt along - it's so exciting. I've got the button on my blog, and I am chomping at the bit. I plan to use the same colors, but each square will be a different print, scrappier and I can use smaller pieces. Sounds like fun, and I love Tetris! Thanks for running this "contest". Oh, jeez, as if I don't have enough projects going on already... hmm, maybe I could make just a pillow? Or 2, or three, or try the whole darn quilt... and we all know why I have at least 6 WIPs on what used to be a clothes-drying rack, but is now the temporary resting place of everything I'm *stlll* working on! I'll probably play along! Let's face it, I have no will power when it comes to starting super fun projects! And, I love tetris! I'm not a tetris person at all, but I have a nephew who is :). I think I'm just watching from the sidelines on this quilt along. Right now I'm kinda focused on embroidery, but I go back and forth all the time and I'd LOVE that jelly roll! Thanks! I loved tetris as a kid! I will have to think about what kind of fabric I'd use for this. Wish I could participate, but I'll definitely watch from the sidelines. Such a nifty idea! I can't wait to see some of the results. I will be following along but not participating. I love sew-alongs, even when I don't actually join in. It's so inspiring to see all the different interpretations of one project. I'm going to give it a try. There's two weeks in there that we'll be on vacation, but hopefully I can catch up! I'll be following the progress of the Quilt-a-Long, but not participating. Too much on my plate right now. But thanks for the chance to win. Can't imagine where you thought this up! Looks fun, after reunions. I am so excited for this to get started! It is going to be a lot of fun to to see how my quilt turns out along with everyone elses. I would love any additions I can get to help my quilt designs come about. Thanks. I can't wait to receive the fabric and get started. This is my first quilt along and I love Tetris. Im so excited, Thanks for the oppportunity to win. This is my first quilt along. My friend has been asking me to make him a quilt, and decided he wanted a tetris quilt. I have been putting it off until I saw this QAL and I'm really excited about it! Thanks for hosting this! I love Tetris and I am so excited about this quilt-a-long! Tetris has been my favorite video game since I was 11 and playing it on my old school Gameboy. The only person I know who loves Tetris as much as me is my little brother who will get this quilt as a surprise for Christmas! I always loved the game Tetris. I'm not sure that I will have the time to join this QAL as I just started a new job and never know what my schedule is going to be. I've done 1 QAL before and ended up getting sick 2 weeks before the end so I didn't get my top finished in time to qualify for any of the prizes. But I did finish it! I have never done a quilt along, but this is tempting. I have so many projects on the burners already that I really shouldn't. I'm watching from the sidelines, too much else to do here atm! I think this is such a great idea so I am adding it to my list of quilt-alongs that I will get to long after they are finished LOL!! Ah, this is AWESOME! I LOVE tetris (it was my go to game when I was bored in class during grad school) and I absolutely love this idea. This looks fun! my only reservation would be finding enough different colours! Not sure I understand exactly what I am doing but I am excited to start this. I am picking fabrics from my stash as I type. This will be a great one to use up some of my stash. I have wayyyyyy too much fabric. I am definitely doing this ...Tetris was the first video game that I learned to play..years ago...and I still play it now again. I have my pieces cut and ready...can't wait..
Love playing tetris. Still undecided about joining in. I live in Australia. Will definitely watch how all the quilts come together. I will be following you guys! I can't commit to sewing though. Too much going on right now. I would love to join in if I had the time! This looks like it would be fun. I have never played Tetris and now I wish I would have done the swap. Will love seeing how everyones turns out. Looks really great so far! Oh my goodness I'm so excited I can't stand it! I adore Tetris! We used to have playoffs in my family with brackets and everything. Good times! I love how you're working it up and I can't wait to see my charms when they come in the mail! And those prizes, holy cow! Those are more than enough to keep me motivated! I haven't played tetris in over 16 years. I used to play it at work (yes, the boss knew. It was a de-stresser!). I won't be joining in as I have too many other things on the go but will enjoy seeing what everyone else is doing. I've never done a Quilt a Long- yet. I'm not a tetris fan but am a pre-cut fan... Thanks for the giveaway. Wow! Wonderful QAL. I think I will join. I'm off to check my fabrics. This looks like a lot of fun. I wont be able to participate, but I will be following along. Thanks for the giveaway. I love this idea! I have some really boring tea towels that need something... anything, and this might just be the ticket! I am not a Tetris junkie but I did play a fair bit of it when I was younger. I'm going to join in, but I'll be playing catch up right from the get-go as I'm on holidays the first week. I'm going scrappy and using smaller squares. 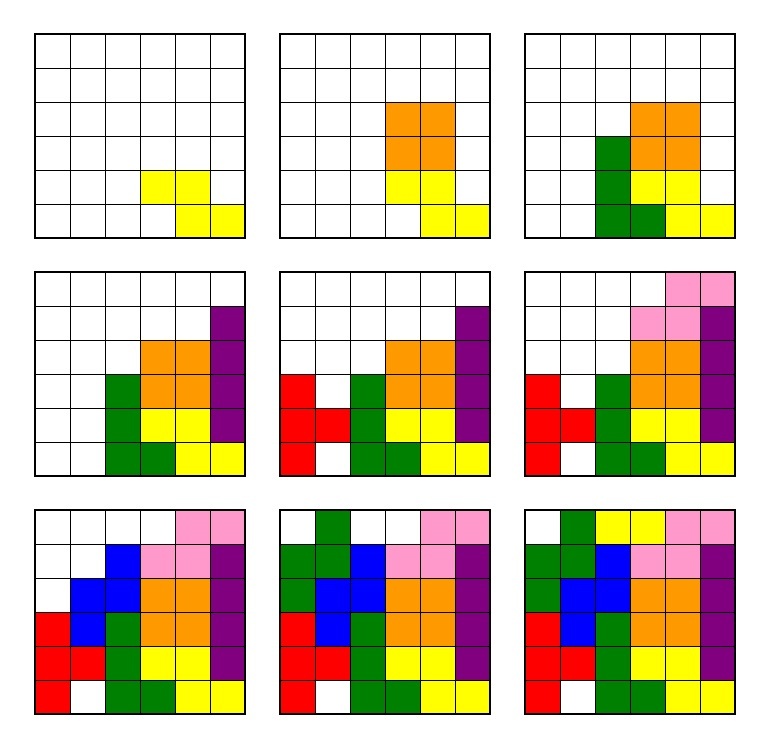 I'm ,going to play but will make a version based on 2.5 squares. I think I am going to watch from the sidelines!! I am looking forward to seeing the lovely creations!! I enjoyed your last QAL. Thinking about joining in... going on vacation at the end of this week for ten days and I haven't decided on fabric choices so I'll be really late in starting if I join in. Would love to join in as I enjoy quilting along with others and seeing their pictures of what they've created. Such fun. I'm not participating because I have so many other tasks going on right now - but my husband expressed interest in this, so I might change my mind, I'll have to ask him when he gets home! I am so eagerly awaiting my charm squares in the mail to see all the eye candy! I am going to make this quilt, because I love Quilt Alongs, I think I might have an addiction to them really. The fact that I can put my puzzle together a way no one else is doing it as well, I love it. Let's get the party started. Come On Tuesday!!!! I don't think I have time to participate. There are too many great quilt a longs going on right now. But I may change my mind and do a mini version. I love tetris but I have so many projects going right now I think my head would just spin off if I started another! Can't wait to see it all put together. This sounds interesting, but I'll probably watch from the sidelines. I love jelly rolls! Thanks for the giveaway! I did the charm swap, joined the quilt along, and have never played tetris before but it sure sounds like a lot of fun. Also this is my first swap and quilt along. Look forward to getting my charms and beginning. Winning the fabric or any of the prizes would just top it all! Thanks for the giveaways and hosting the quilting along and swap. I loveeee Tetris. I still play it online. I used to play it on my Nintendo as a kid. I think it's a great game to improve your reaction time and problem solving skills. Awesome to think to make a quilt from it! Tetris was/is my absolute favorite video game, so I thought it very appropriate that it should be both my first swap and my first quilt along! Can't wait to get my charms in the mail and get started! Thanks for these awesome giveaways!! Yes, I am a Tetris junkie, and even love the music. This looks like great fun...now to see whether I have fabric for it, as I'd love to join the party! The colors in that jelly roll are so beautiful. My plate is full this time, so I will be cheering everyone on from the sidelines and drooling over all your hard work. What a fun idea Melissa. I will be watching on the sidelines, cheering you all on. There is a specific Tetris that I love playing, it's a version that you 'fight' against another person. My eldest son and I used to have a great time with it. Hi Melissa, I am encouraging you all. Now true confession never heard of Tetris until you asked about is anyone interested - then the overwhelming response. Still haven't seen or played it But looking forward to everyone playing this quilting game. Thanks to Judi at the wonderful Green Fairy as I love that shop and Aneela Hoey just must look up Moda as haven't seen this design. Tetris is a favorite game of mine! In college my friend had a Monty Python version of the game, where it was bodies and every once in awhile, one would go "i'm not dead yet!" and wiggle around while you tried to place it. good times. I love Tetris. I used to play on my T86 calculator in high school (way before smart phones existed) and of course on when it first came out on the Nintendo NES. I would play for hours! I am planning to quilt along as I have fond memories of Tetris "tournaments" with my brothers and friends and because I love video game quilts. Looking forward to watching the quilt along to see if its something I would like to work on. No time to participate right now, but I will enjoy watching from the sidelines. My college daugther I sent the link to - so I think she should do it as she loves Tetris and I will cheer her on! lol I am doing a beginners QAL right now - my first one! thanks! Adoro isso,tenho jogado por 20 anos só trocando pilhas de vez em guando,dá uma animação quando a velocidade é aumentada,gosto do pequeno e não aqui no computador.Vou aproveitar e tentar fazer junto sem participar diretamente,estou as voltas com bordados agora,mas tenho certeza da diversão.Beijos. This quilt along looks like so much fun! I wish I could have participated in the swap, but the timing was not right. I may play along with some 2.5 inch squares and do a small quilt up. Tetris will always be a fun game! The quilt along looks great. I will have to watch along from the side. Thanks for the offer of the jellyroll. I'm in--will figure it out as we go!! This quilt-a-long looks like fun! I'm not joining in this time, because I'm in the middle of one project and have plans and fabric for my next one already waiting. I can't mentally handle multiple WIPs at a time! I have to finish one before I start the next. I love quilt alongs ! They are inspiring and it makes you keep up with your sewing time. My only problem is loading pictures...I'm a techno-failure! With my crazy schedule I can't join a QAL, so I just dream from the sidelines. Unfortunately, I can't join Quilt Along.....like most quilters I have so many deadlines on other unfinished projects. I wish that wasn't the case, but there is always something popping up, like 6 new nieces and nephews within 3 months. I still read every blog though about QAL and hope that the next time one rolls around I will be less busy. Thank you so much for offering the giveaway to even those who aren't participating. Aneela Hoey is one of my top favorite designers. 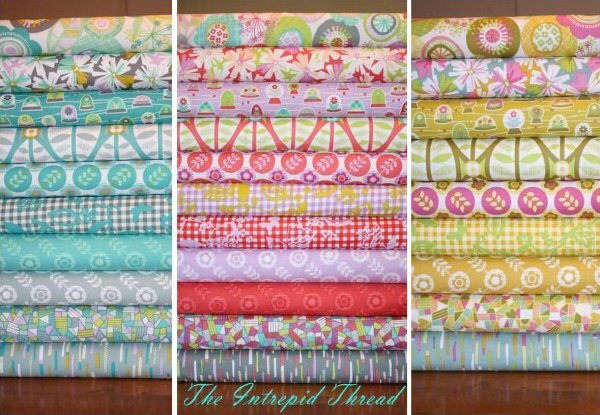 I would so love a jelly roll with her designs. I want to participate badly but it looks like I'll be sitting this one out. I can't wait to see what everyone comes up with. Sew Stitchy is an amazing prize! Thanks for the chance to win! I have a lot of solids that need to be used up. I'm going sit this one out. I have so many other quilts I want to make or that need to be finished. But I can't wait to see the quilts everyone makes. Also, I do love going in on quilt a longs. This quilt a long looks awesome but I was never that good at the game when younger. I soo want to, but I may have to sit from the sidelines, at least until I finish my Soda Pop QAL quilt. I follow you, so I'm going to have fun watching, but I don't have the time to start another project right now. I love quilt a longs and charms, but right now I don't think I can commit - I'll be watching though! I am working on about 5 quilts right now, plus wedding projects, so I'm pretty swamped! Making a Tetris quilt sounds like lots of fun. I love the game of Tetris, but haven't played it in ages. This sounds like a great quilt and a good way to get my Tetris fix. Thanks for planning this. I will start cutting fabric tomorrow. This will be a good scrapbuster project, too. WoW! What a neat idea for a quilt! I'm alittle over extended at the moment with classes and family but I will be a cheerleader for sure! I would love to try one block though just to see what I came up with. I think you did a great job explaining how it works and the pictures helped as well. How fun! 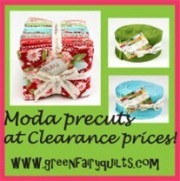 Thank you and Green Fairy Quilts for your random giveaway and a chance to win some gorgeous fabric. It will be fun! I'm in! I'm a lurker on the side lines a well. But I am certainly tempted, if I didn't have way too many projects mocking me all around my sewing loft....sigh, need ear plugs some days.....grin. I am so excited to start this quilt along. I just got my fabric from the swap in the mail and it is all so beautiful. My friend (boss-lady) is doing the quilt along and the fabric swap. She had me cut half the squares and said that if I wanted one for my boy all I had to do was cut out more squares!!!! Still not sure if I want to cut fabric ever again. Maybe if I find someone willing to cut them for me I;ll get a finished quilt with the total cost being fabric, plus bandaids (Haven't figured out how to keep fingers from being rolled over by the cutter!) and a few anxiety attacks keeping my gal on task. Either way she will be back from her trip in about a week ow and I am super jazzed because I'll get to watch my first quilted tetris game! I'm confused somewhat on the directions as have never played tetris. However, if win this jelly you can bet that I will be playing along regardless. Thanks to the Green Fairy! I *just* found out about this QAL and am trying to balance my calendar now to see if I can fit it in. I'm really gonna try cause it looks like a lot of fun. I will be watching with wonderment and hopefully getting up the courage to someday join in:) Everyone is so talented and I learn so much. thank you to all. Awesome! This one looks so easy that I think I am going to participate. I really would love to make this quilt for my mom, for all the nights staying up late as a kid with her playing Tetris (and Dr. Mario until 2AM). I got my charms today, I am ready to go! Yes I am going to participate in the quiltalong. I can't wait to start. Looking forward to this quilt a long. I loved playing tetris and this looks like a lot of fun. While this looks like an extremely fun QAL, I'm going to be cheering you on from the sidelines. Too many unfinished quilts draped across my sewing table (or scattered in tiny pieces...). Thanks for giving me a chance to enter for one of your fabulous prizes, though. i love the tetris idea! I do like quilt alongs; it helps to keep me focused and actually FINISH a project! :) Maybe the next one???? I used to love Tetris, and love the QAL you're doing. However, with a 2 week old baby, I think I'll sit back and watch what the others do. I may come back to this one later on in the year. I'm watching from the sidelines...I'm new to quilting and hoping one day to have enough confidence (and skill) to play along too. Love Tetris...it was my favorite game when it first came out. I think this is going to be such fun! I need to use up my scraps (so I can buy more fabric? ;) ) and this is a wonderful opportunity! Thanks Melissa!! This may be just the thing i need to make a quilt this summer. And since i LOVE Tetris, I know I'll want to do it. Probably not making one this time around but watching with great interest and cheering from this section. Luck and good fortune to you. WOW! Talk about a Quilt A Long!!! This sounds fabulous! I do like QALs. But I have never committed to be part of one while it is active. (I usually find out about them after they start). I would like to be a participant. I am a old Tetris Junkie. Your Giveaway Prizes are a real motivation! Sounds like fun. Never played Tetris, but I want to play along. Ok . . . I'm paying attention now. Lots of great giveaways and a fun QAL. I'm in. I know I am a little late but I am joining in! I am working again tonight but have posted my plans on my blog. I will catch up on weeks one and two this week, I hope! Thanks for hostessing. This will be so much fun. I loved playing Tetris with my boys. This looks like a great quilt game to join but I can't play since I don't have a camera. I wouldn't be able to post pictures. No smart phone either. This sounds really fun especially as I am a Tetris junkie. Even though I am late starting I will be joining in.